FAKE ALERT! This is not the new Swedish House Mafia single!!! As I’m always looking for new material for the blog I found a video where Axwell is playing a new tune. The rumors were pretty big that this could be the new Swedish House Mafia single. There was also a video in which Laidback Luke was spinning this record as well but as it turned out it was all FAKE! Someone “creative” only set up some old videos with a different audio track and was looking for some feedback and rumors. The original video of Laidback Luke was, like you can see, from 2008. So what do we learn from this? Don’t believe anything if you’re looking for fresh footage and always try to ask the people who are featured in the videos. As you can see they probably will help you out. I asked Laidback Luke but when he replied on twitter I first thought it was just ironic but today he opposed and added the link to the original video. Concerning this track I’m pretty happy that it’s nothing new from the Swedes because I thought it was kinda lame and a mixture of “One” and “Miami to Ibiza” with some strange opera vocals on it. 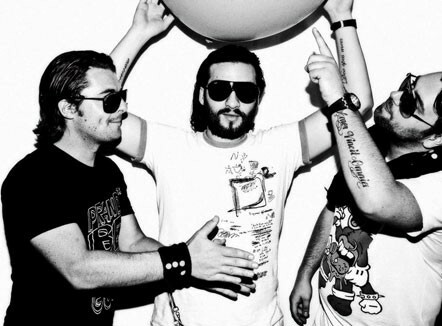 For more info check also the discussion on the Swedish House Mafia forum! Below you can see what the label called MOVE Records commented on the videos and I added you the video of Axwell. The one with Laidback Luke just has been set to private!!! I am the promoter of the MOVE Records, the song in question is of our label and is not SHM or Laidback Luke, please note that these videos were not made by us and none of our team.We do not know if real or fake, the song is not out yet but hold only about 30 Top International Deejay including SHM, Laidback Luke, but we have no﻿ evidence yet that they are using it. In accordance with the﻿ users to avoid saying this song title and artist to not use this forum as advertising.